Education abroad is always a great and life changing experience. So while opting for education abroad one must be careful in selecting the university and the course. 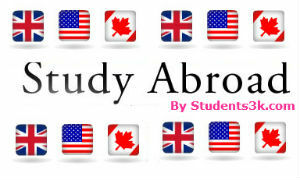 This article shows you a list of best Universities to study abroad. Especially about U.S, U.K &Canada universities. Harvard University is one of the most reputed and oldest university of United States and it was established in the year 1636. The university is located in Cambridge, Massachusetts, U.S.
Columbia University is located in Manhattan, New York, United States and was established in the year 1754. Columbia University has three undergraduate schools such as The Fu Foundation School of Engineering and Applied Science, Columbia College and School of General Studies. University of Toronto was established on March 15, 1827 and is located in Toronto, Ontario, Canada. It is a public research university with 33,318 undergraduates and 12,732 post graduates. Cornell University is a private university established in the year 1865 and is located in Ithaca, New York, U.S. This university has totally 7 undergraduate colleges and two satellite medical campuses. This has student strength of 20,939 students. Georgetown University was established on January 23, 1789 and it is located in Washington D.C, United States. This university has three campuses: Undergraduate campus, the medical center and law center. Indiana University was established on January 20, 1820 and it is located in Bloomington, Indiana, USA. This university has totally 110,436 students which include 89,176 undergraduate students and 21,260 post graduates. The Michigan State University was established on February 12, 1855 and is located in East Lansing, Michigan. This is one of the top research universities in the world. New York University is a private university which was established in the year 1831 and it is located in New York City, United States. This university has totally 18 schools and has total students strength of 38,391. Princeton University the 4th oldest college of United States was established in the year 1746 and is located in Princeton, New Jersey, United States. This university has under graduate students of 5,113 and post graduate students of 2,479. Stanford University is located in California, United States and was established in the year 1891. The university is divided into seven schools which include: Engineering, Law, Medicine, Humanities and Science, Schools of Business, School of Education. Truman State University was established in the year 1867 and is located in Kirksville, Missouri, United States. This university has totally 6,101 students. Cambridge University is the third oldest university in the world and is located in United Kingdom. This university has approximately 12,000 under graduates and 6,000 post graduates. This university is divided in to several sites such as old schools, Addenbroke’s etc. University of Pennsylvania was established in the year 1740 and is located in Philadelphia, Pennsylvania, United States. It is a private research university and has total number of students of 21,329. Oregon State University was established in the year 1868 and is located in Corvallis, Oregon, United States. It is a public research university which offers graduate, post graduate and doctoral degrees. Yale University is a private university which was established in the year 1701 and is located in New Haven, Connecticut, United States. This is the second largest academic institution in the world. This university comprises of 13 professional schools totally. Massachusetts Institute of Technology is established in the year 1861 and located in Boston, Massachusetts, USA. This university has totally 5 schools and college and its mission is to is to advance knowledge and educate students in science, technology, and other areas of scholarship that will best serve the nation and the world in the 21st century. University of California was established in the year 1868 and located in Oakland, California, United States. It consists of totally ten campuses and has the student’s count of 179,581 undergraduate students and 54,883 post graduate students. California Institute of Technology is established in the 1891 and located in California, United States. This institution is mainly famous for science and engineering courses. Imperial College London was established on July 8, 1907 and is located in London, United Kingdom. This institution is divided into 4 main campuses: Imperial College Faculty of Medicine, Imperial College Faculty of Natural Sciences, Imperial College Faculty of Engineering and the Imperial College Business School. Johns Hopkins University was established on 1876 and is located in Baltimore, Maryland, United States. This university is divided into two undergraduate divisions and five graduate divisions.